My “Ultimate Chocolate Cake” is beyond moist. You could LITERALLY leave out it on the counter for several days and it would still be luscious. The surprise favorite for me on this cake were the cacao nibs. I’ve been making a lot of cakes and desserts using fresh fruit. There has been quite a bounty at the market, and I love a seasonal treat. That being said, I heard the siren’s song of chocolate calling my name. At first, it was a whisper, then it became more of a drum beat; urging me to make the most decadent dessert possible! 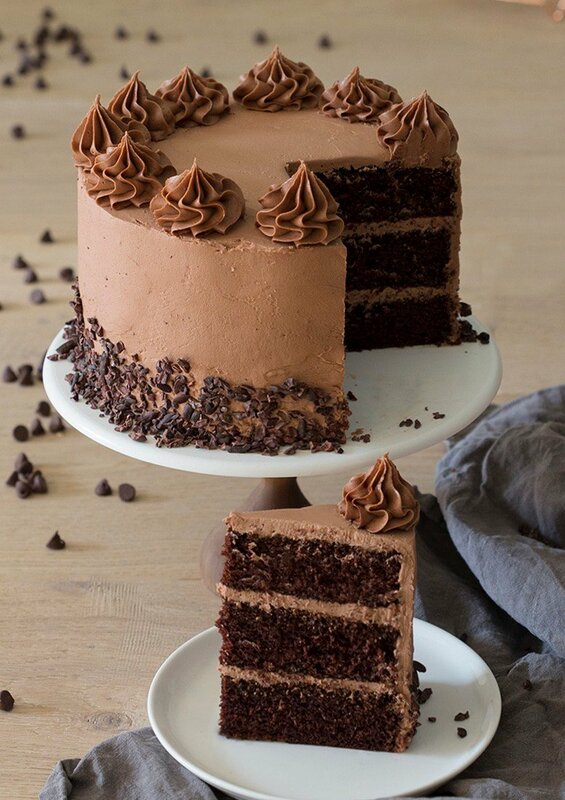 I don’t use the term ultimate lightly so if you are a chocolate lover I HIGHLY encourage you to make this cake!! For those of you who have not been exposed to these little delights, they’re pure, unprocessed chocolate aka they’re very crunchy and chocolatey (vaguely bitter). 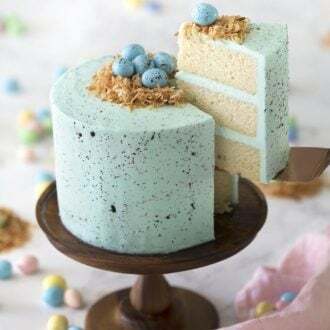 They contrast the buttercream nicely and prevent the cake from cloying. How do you make a simple chocolate cake? Sift and whisk dry ingredients together. Add wet to dry mixture and mix until combined. Bake in prepared pans until centers are springy to the touch. What makes the cake moist and fluffy? Adding the right amount of fat gives chocolate cake a moist crumb. Using oil, as I did in this recipe lets you chill the cake without having to worry about it hardening. Fluffiness comes from using the right amount of leavening agent; too much and the cake will collapse, too little and it will be dense. If you head over to my German Chocolate Cake post you will see another way to get a moist and fluffy crumb; creaming the butter and sugar coupled with whipping egg whites until they reach the soft peak stage then folding them into the batter. How do you make a chocolate cake moist from scratch? Use a nice quality cocoa powder, fresh ingredients and remember to balance the sweetness with a bit of salt. 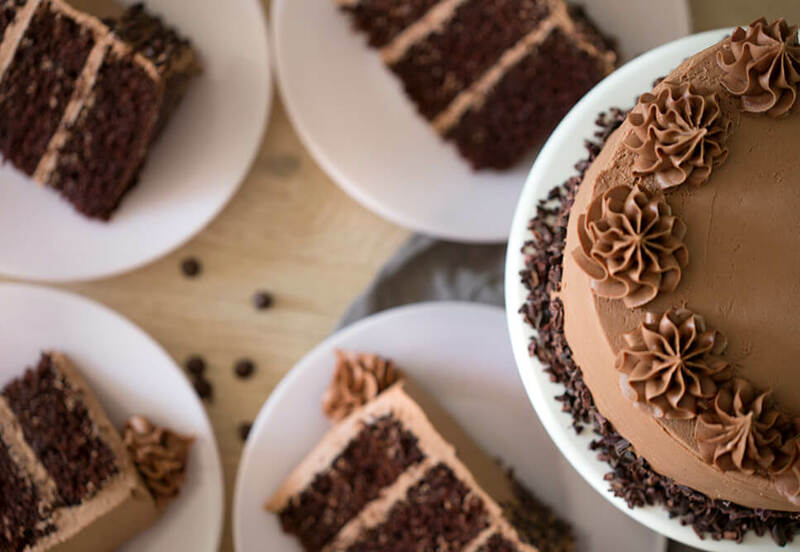 Follow the recipe below for the most moist and fluffy chocolate cake imaginable. Don’t over bake your layers! Watch the batter and remove from oven when the centers spring back when pressed lightly and the edge starts pulling away from the pan. 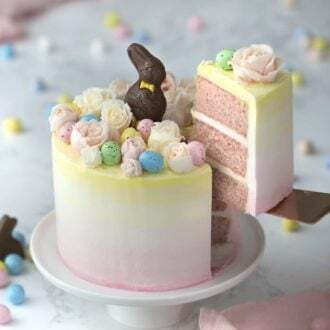 If you find cake decorating to be a bit intimidating then check out my How to Decorate a Cake post, it has lots of helpful tips and a full how to video. The batter is very liquidy so while it will be AMAZINGLY MOIST the cook time will be longer than your average chocolate cake. If you are not a coffee fan then sub in milk, or water. 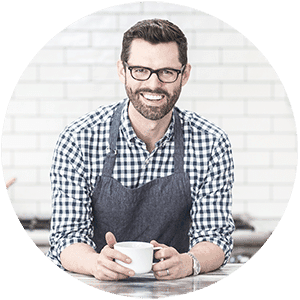 The coffee, which you really don’t taste, helps bring the chocolate taste out but I know lots of people either can’t stand it or have dietary restrictions. If you don’t have sour cream handy then plain whole milk yogurt will work just fine! Buttermilk can be annoying to keep on hand as it expires quickly and most recipes use very little. I often use powdered buttermilk reconstituted with water or add a tablespoon of lemon juice into some whole milk to curdle it. I’m OBSESSED with cacao nibs but you can totally skip them, or sub in chopped nuts. Use your favorite and never forget to toast them!! On a personal note — I have to share that my husband and I ate EVERY PIECE OF THIS CAKE and have NO REGRETS! Let me know if you have as much difficulty keeping your hands off this cake as we did! How do you make a homemade chocolate cake? Butter and flour three 8-inch cake pans. I highly recommend using cake strips for a more even bake. Sift together the dry ingredients (including the sugar) into the bowl of a stand mixer and whisk to combine. Add the wet ingredients the dry ingredients. Whisk to combine then mix on level 2 for two minutes. Distribute batter evenly to the three pans and bake for about 35-40 minutes at 350F or until a toothpick inserted in the center comes out clean. I recommend rotating the pans halfway through the bake. Allow time to cool for 10 minutes then invert onto wire racks to cool fully. In a small bowl combine the semi-sweet chocolate with 2 tbs of cream then microwave for 40 secs on half power. Stir to combine then set aside. Whip the butter for about 5 minutes using a paddle attachment (in a stand-up mixer). Beat in the confectioner’s sugar slowly. Add the cream. Slowly mix in the ¼ cup of cocoa powder. Add the salt, as well. You may add the optional vanilla and espresso at this step. Mix until you have a fluffy, even consistency. Beat in the melted and cooled chocolate ganache. Pipe chocolate buttercream between each layer. Pipe the buttercream on the outside of the cake. Smooth with a bench scraper and offset spatula. Press cocoa nibs to the bottom of the cake (or the entire side, if desired). Use an 869 tip to pipe dollops on top. 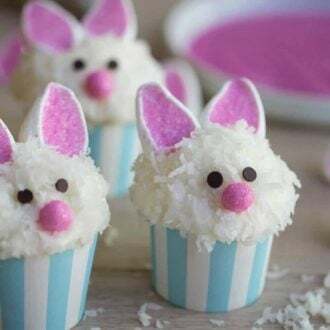 If you’ve tried this recipe then don’t forget to rate the recipe and let me know how you got on in the comments below, I love hearing from you! Simply the best chocolate cake I've ever had. 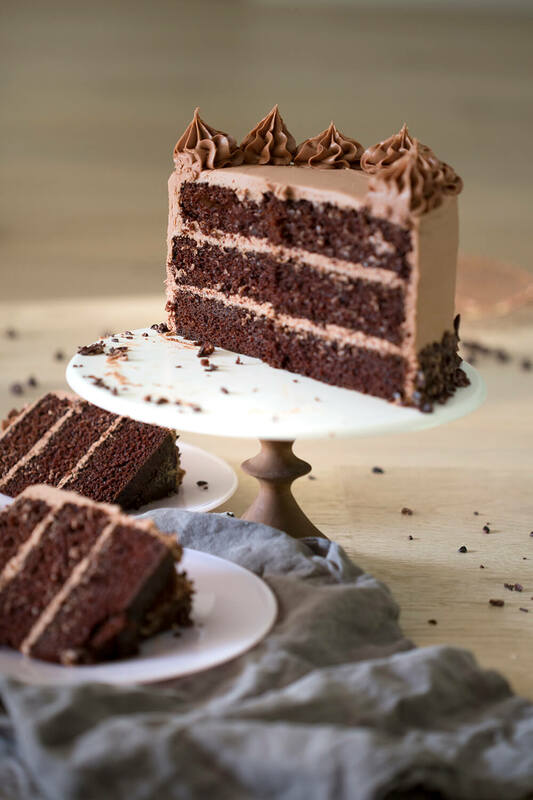 Rich, ultra moist, fluffy and that chocolate buttercream is just divine! Butter and flour 3 eight inch cake pans. I highly recommend using cake strips for a more even bake. Add the wet ingredients the dry ingredients. Whisk to combine then mix on level 2 for two minutes. Distribute batter evenly to the three pans and bake for about 35-40 minutes at 350F (176C) or until a toothpick inserted in the center comes out clean. I recommend rotating the pans halfway through the bake. Allow time to cool for 10 minutes then invert onto wire racks to cool fully. In a small bowl combine the semi-sweet chocolate with 2 tbs of cream then microwave for 40 secs on half power. Stir to combine then set aside. Whip the butter for about 5 minutes using a paddle attachment (in a stand-up mixer). Slowly mix in the ¼ cup of cocoa powder. Add the salt, as well. You may add the optional vanilla and espresso at this step. Mix until you have a fluffy, even consistency. Beat in the melted and cooled chocolate ganache. Add a smooth coat of chocolate buttercream to the surface of the cake. Hi! If I make the buttercream a day earlier before decorating what is the best way to store the buttercream? Store it in a ziplock bag. Try your best to make sure there is no air in the bag. When you’re ready to use it, let it come to room temperature then give it a quick whip. I’m trying make this Cake eggless what should I do? Maybe a commercial egg replacer or buttermilk or just skipping the eggs entirely? If I use buttermilk how much should I use for the 3 eggs. Hi John! I love your tutorials – they are so thorough and you are adorable! 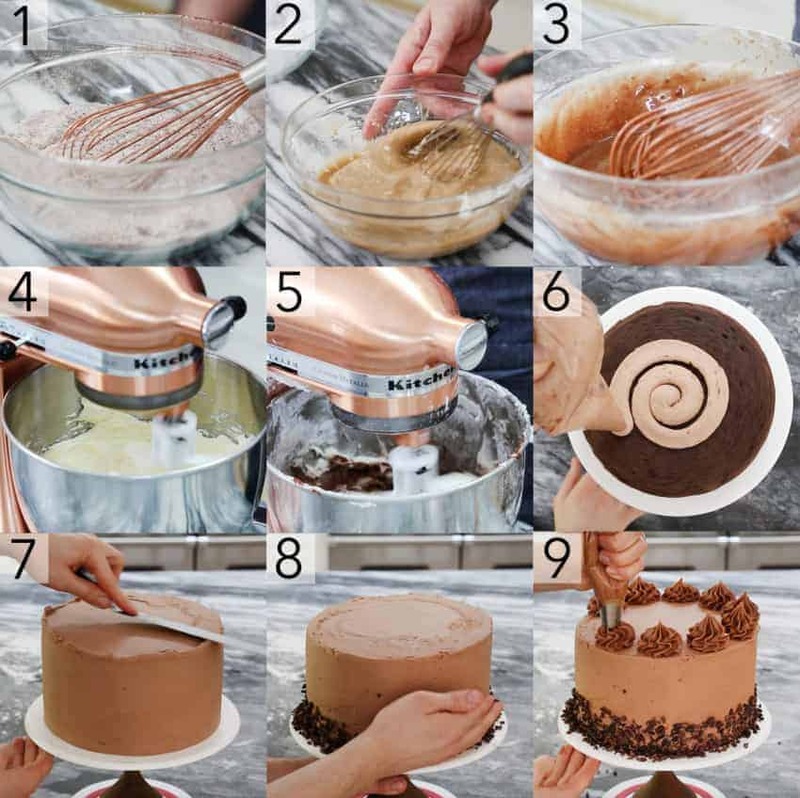 I’m planning on making this as a two-layer in 6″ pans and use the rest of the batter for cupcakes. How long would you say the cupcakes should bake? 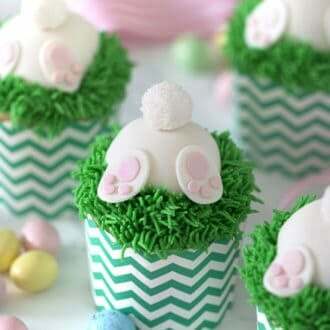 I haven’t made cupcakes or cake in a long time, so I’d like to know from a pro! Thank you! About 15 minutes! THat’s the sweetest compliment! Thanks so much Rachel!!! I’ve made this cake twice and both times it was a big hit. I used Swiss Meringue Buttercream the first time and Ermine frosting the second (I didn’t realize I only had two eggs). Both times I frosted the cake then froze it in the pan like Christina Tosi. I took it out of the freezer the morning of the event, removed the cake from the pan and let it thaw. I had reserved a little frosting in the freezer too so I could decorate a bit more. No one could believe it had been frozen. It was super moist and delicious. Thanks for such a great recipe. I’m so glad you liked it and I might need to try that freezing trick out! I just made this chocolate cake for my nephews birthday cake. He wanted a chocolate cake, so I decided to try this one, and I’m glad I did. It was so moist and tender. It was a hit, everyone loved it. I doubled the recipe and made 4 9” layers and 10 cupcakes with the extra batter. I made it a piñata cake, cutting a 4” circle from 2 of the center layers and filling it with candies. I frosted it with the chocolate frosting and a skirt of chocolate sprinkles instead of the cocoa nibs because it was a cake for a five year old. I was a little nervous it wouldn’t be sturdy enough to be a piñata cake as it was so tender, but it worked and was delicious. I would definitely make this again. 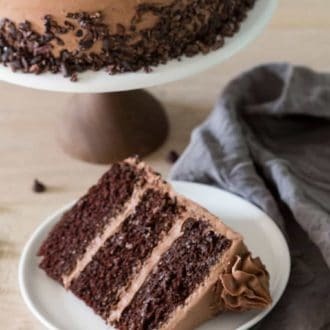 Thank you for such a great chocolate cake recipe, I’ve tried many and this one is the best. Thank you so much. I’m glad to hear you made this cake for your nephews birthday and that it was such a hit. I LOVE this cake myself. Is there a substitute for kosher salt because in Australia that doesn’t exist. Using regular salt will work. I hope you enjoy this cake as much as I do. Thanks for this awesome recipe. I used it to make tiered naked cake for my nephew’s first birthday. Looks good and tastes even better! I’m happy to hear that! I love this cake so much. Excellent! I’m looking for an excuse to make it again soon! Lol It’s a 10 star! That is so sweet, thank you! If it helps, I don’t think you need an excuse to make something delicious! I would like to try this on a 10 square. Would I double it to make 2 10 inch squares? Baking time? I made this cake a couple weeks ago, although I used SMBC because I prefer it to american buttercream. Everyone loved the cake. It was very rich and moist. I don’t think I’ve ever had a better chocolate cake. My daughter can’t stop talking about it and asking when we will make it again. (She was particularly amused when we poured coffee in, and now thinks she’s a grownup because she’s “ate coffee”).